In Persona 3 and 4, reality outside of the world of shadows was high school life, social links, and excursions that, for the most part, were enjoyable and light-hearted. In Persona 5, every day life is bleak. From the opening, the main protagonist is threatened, talked down to, and scorned. He stands falsely accused of a crime he tried to prevent and is on probation at Shujin Academy in Tokyo. His companions are outcasts and as Atlus director, Katsura Hashino, states, they “no longer have a place where they belong in society.” In class, the teachers wish you weren’t there. The high school gym teacher and coach, Suguru Kamoshida, bullies and harasses his students. No one is willing to lift a finger to help because Kamoshida has brought prestige to the academy. You spend the first month under the threat of expulsion. Students express surprise if you answer any of the teacher’s academic questions correctly because they assumed you were an ignorant thug. Your guardian, Sojiro Sakura, is gruff and constantly warns you against everything you do. Matters get worse when one of the students, Shiho Suzui, attempts to commit suicide at school following the horrible actions of Coach Kamoshida. Your teammate, Ann Takamaki, who was also a victim of the coach’s harassment, gets subjected to false and malicious rumors by other students. Entering the first Palace is a dark and twisted experience, representing Kamoshida’s warped desires. It’s a monument to his perverted vision of the world, one in which he reigns as king and everyone is subject to his whims. It’s also a Freudian nightmare come true, students slaving over his every whim and even a sick fantasy version of Ann as his personal servant. As gruesome as the shadows you confront are, it was odd because for the first time, my characters felt empowered. Gaining personas, wielding toy weapons that became deadly in the shadow world, and sporting stylish masks, they could finally do something to fight back against the injustices they’d been subjected to daily. The menus are slick, the victory run is addictively cool, and the music, composed by Shoji Meguro, remains some of the best in the series. 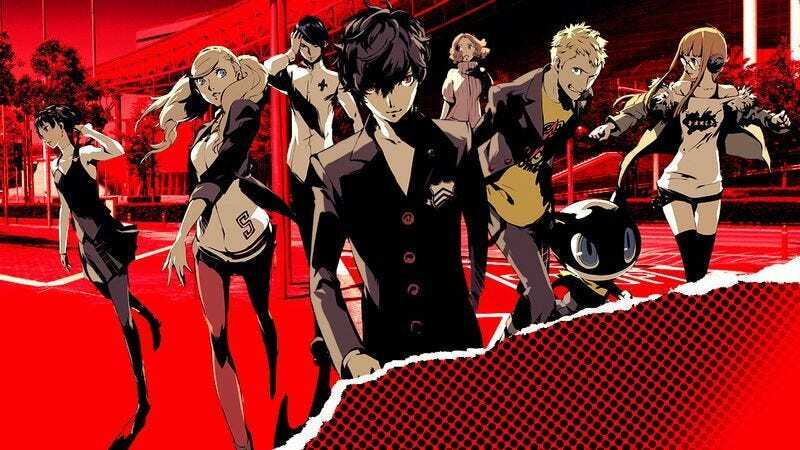 Together with your new friend, Ryuji, a cat called Morgana, and Ann Takamaki, you set out to shatter Kamoshida’s delusions by infiltrating the palace and becoming “phantom thieves of hearts.” You’re literally ripping Kamoshida’s mask off of him so that the lie he lives under gets destroyed and he sees himself for who he really is. In the art world, exploitation is embodied by Ichiryusai Madarame, who everyone praises, but has a dark, murderous secret. He pretends to be humble and big-hearted. But artist block has corrupted him and he uses his student’s art for his own profit. He even takes credit for their work, coldly discarding them when they’re no longer needed. The husks of paintings from those he’s mentally destroyed fill his gallery. Coming from a figure who is revered throughout the country, it seems the Phantom Thieves have no chance. Who would believe their word against a respected visionary like Madarame? The reference to “The Masque of the Red Death” and Prince Prospero’s fatal ball encapsulates the fear almost all the characters have. Everyone in Persona 5 has something they’re desperate to hide. The unmasking animation is painful and bloody. Even after you defeat Kamoshida and he confesses to his crimes, it just seems more people set out to stop you. Many live their lives in ignorance, symbolized visually in that most of the generic NPCs are missing their eyes. That’s why the team meetings feel so genuine and important. Whether hanging out on the high school roof, or down at the secret hiding spot in Shibuya train station, you see the human toll in the victims who have futilely fought for justice. Your friendships have more meaning as you willingly seeking out people to aid. After your first major victory, your party hits up a decadent buffet per Ann’s recommendation and I could feel their excitement that the Phantom Thieves were getting recognition. It was one of the first times that Ryuji and Ann felt like they were being praised for something, rather than the criticism and ridicule they’d become accustomed to. The text messages they share are fun and authentic, if somewhat annoying (Ryuji, stop texting me so much). The graphics are awesome and the streets of Tokyo have never felt as alive. I visited Japan for the first time recently and I found so many areas of Shibuya familiar thanks to the game (I even listened to some Persona 5 music while wandering through the busy subway stations and it was an awesome feeling). Sharing their journey made me think about my high school years, where rules seemed arbitrary and if you were unlucky to have a bad teacher, you didn’t have many options. I remember a plethora of regrets, memories suppressed out of pain, both mental and physical, forming a sort of mask for me to hide behind. But there was Persona 5 again, slipping into my reality with its own, wanting me to take off my mask, giving me no place to hide.